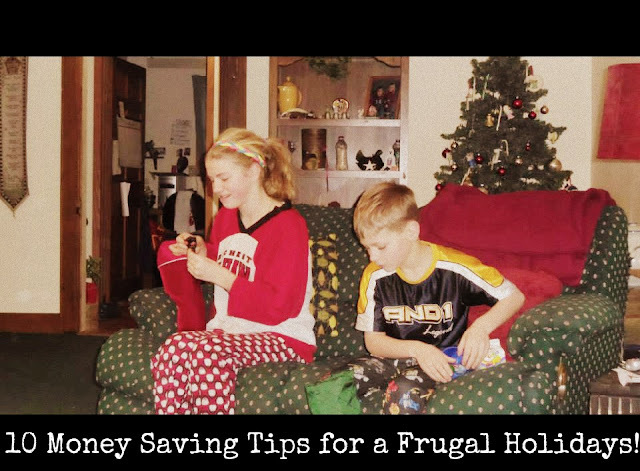 10 Money Saving Tips for a Frugal Holidays! Christmas time can just be a crazy time! So many people you want to give gifts to, so many things your kids want, and only so much money to spend in your wallet! What is a person suppose to do? I am here to help you! I use these tips to help me save money at Christmas and still feel good about the holidays. These tips can help you too! 1. Set a budget! I set a budget for each kid of $75 each and try extremely hard to be under that. I don't have a budget for stockings, but I try to find item cheaply and that will take up some room! 2. Make some of the gifts yourself. Beware: some gifts cost more to make than to just buy. Be a thrifty present maker! Make sure it is a labor of love and not on your wallet. 3. Decide carefully who you are buying gifts for and who you are not. Despite the generosity of the season, not everyone needs a gift. A card stating your appreciation for all they do can be enough. A small plate of cookies is fine too. However, teachers can only get so many cups and plaques before they don't have room for them anymore! 4. After you decide who needs gifts, decide what. Be specific. Make a list. Your child's teacher does not need an elaborate gift. Be reasonable. Most teachers would appreciate a handmade card from your child stating their appreciation of their teacher. 5. Offer your services instead of a gift. Offer a night of free babysitting. Offer free snow shoveling. Offer to make them a meal when you know they will have a crazy busy night. Offer free baking lessons to a younger child or a teen. These gifts are very appreciated and will more than likely be used quickly! 6. Shop the clearance items year round. Stores are trying to get rid of toys in anticipation of the holiday seasons throughout the year. You can snag some great deals that way. Even during the Christmas season, I find a lot of presents from the clearance shelves. 7. Shop Black Friday or Cyber Monday. I can't stand the craziness of Black Friday, but the deals are awesome on a lot of things. They are just as good on Cyber Monday when a computer and a cup of tea are all you need. Just don't spend more than you need to! 8. Used can be as good as new. My kids have gotten a lot of used things as gifts. Heck, I am not sure some of the things they got were ever used, but I found them at thrift shops and garage sales. I buy a lot of the books I give them used for very little money. When I score like that, I can't get much happier! 9. Think practical on Christmas stockings. I have two broke college students now who appreciate the practical things like lip balm, pocket tissues, fingernail clippers, razors, tweezers, pens, ponytail holders, bobby pins, hair bands, and so on. I put a few fun things in the stockings too, but the kids always appreciate the practical things too. I usually get an "Oh cool, I needed some of these!". 10. Limit the gifts! I give my kids four gifts each and a full stocking. I also buy 2-3 movies as family gifts. I keep the gift count set to four to make reasonable, practical, and not to set unrealistic expectations for my kids. I don't worry about how much I spend on each kid because I have a budget (see #1) and I stick to it. How do you make your holidays a frugal affair? Are You Struggling Financially This Christmas?